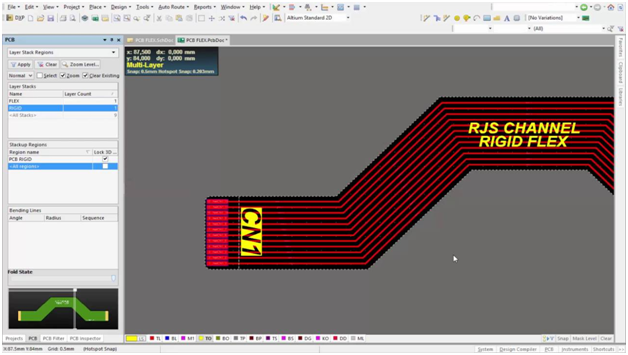 When ordering rigid-flex or flex circuits online, if your design faces technical issues or if the data is incomplete your quick turn order delivery can be delayed. The technical issues may arise due to an error in the manufacturing or the end use of the parts. These technical issues are resolved through communications and in some cases, thorough design revision. This will set back the pre-set delivery date of the products. The real question is how to avoid such issues from arising? Here we will discuss some of the common issues you might face and how you can avoid delays caused by these issues. In this way you can complete assembly and delivery of your product as soon as possible. This has to be one of the leading causes of delays in quick turn delivery. While submitting your data you will always be urged to recheck whether or not the data you provided is complete or not. Your data set should contain the required Gerber file(s), a mechanical drawing or spec sheet with required specifications and a material stack up. Also check if the data you have provided is correct or not. The material stack up you provide may not include all details at times as some cases are outside the customer’s scope. However, you must mention the copper weight requirements and the desirable thickness to meet your requirements. Preferably, you should use less copper thickness in order for a more flexible and reliable product. Common copper weights include ? oz and 1 oz if the current carrying requirements are higher. Another mistake is when you do not factor the mechanical bend requirements into the design, and in some cases the bend requirements are incorrectly specified and may exceed the physical capabilities of the material being used. In order to ensure that your finished product performs well you should provide the overview of how the part is to be used and where the bends are located or the radius of the bends Etc. The IPC 2223 flex circuit design standards have a number of additional design rules that ensure your finished product performs well. Why not discuss a few of them in order to give you a better idea about circuit design issues. Stiffeners should be used to make the component areas rigid. This will also prevent the part to bent adjacent to components and limit chances of solder joint breakage. Not recommended as they may lead to solder joint breakage. These are also not recommended as they can lead to mechanical stress formation when the circuit is bent and this can lead to cracks. 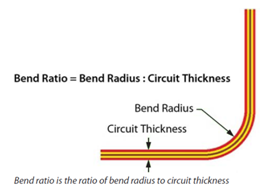 90 degrees trace corners in flex areas can also create mechanical stress when the circuit is bent which once again, leads to cracks and breakage. 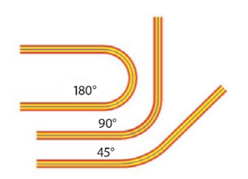 If a direction change is required then use radiused corners. It is also important to correctly define the ZIF contacts in your Gerber data/material stack up. This includes contact finger locations/dimensions/spacing, local part outline dimensions, coverlay opening dimensions, and stiffener thickness/dimensions. These elements will ensure a reliable interconnection between your flex circuit and ZIF connector. You should also supply the part number along with the make so your design can be verified according to the manufacturer’s specifications. EMI/RF shield layers, either one side or two sided, ground interconnect locations etc. Before providing data or choosing your requirements make sure to see the design rules regarding all these parts. Remember to keep your design as manufacture-able as possible. A simpler design reduces chances of error. You should also contact your engineer and discuss the design project so your finished design is accurate. 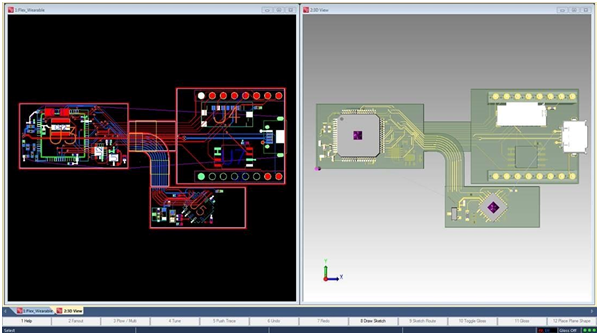 In order for your design to avoid any technical issues so your quick turn order is not delayed you must provide an accurate and complete data set. This will help to avoid mistakes and errors and your design is sure to be completed on time.